One of our technicians brought a failed motor in this week. This motor is in the worst condition I have seen in decades. 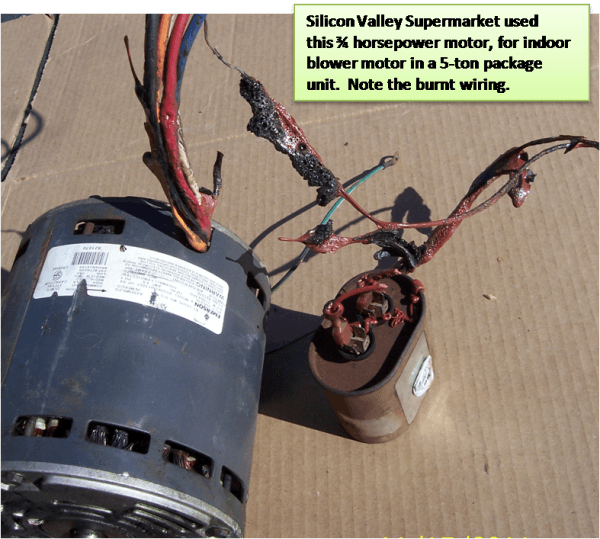 Below is a ¾ horsepower motor, which was used as the indoor blower motor in a 5-ton package unit for a Silicon Valley supermarket. The oval device (see below) is a run capacitor. 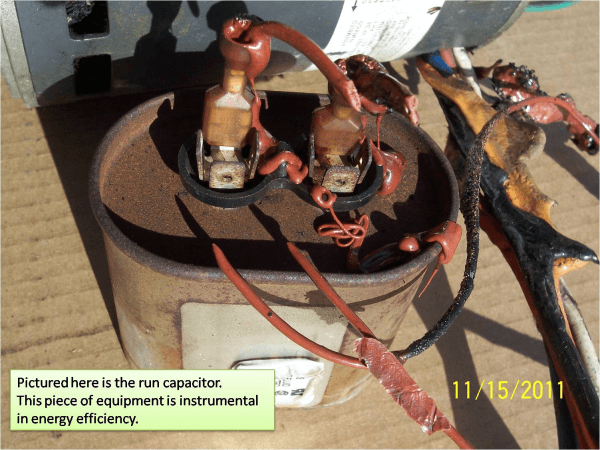 Capacitors help increase the motor torque and efficiency by storing energy for a moment. The ability to use energy in a controlled manner rather than all at once is one of the ways a capacitor increase your motor efficiency. These motors also have safety mechanisms designed to keep your equipment working, and electrical controls on the circuit boards to make sure when one function begins, the other functions stop. Our technician found the heating safety was disconnected. The circuit board for this unit had also failed, which likely meant that 2 of the 4 speeds were on simultaneously, fighting one another. Imagine if your car was trying to be in 1st gear and 4th gear at the same time. It would probably catch on fire the first time you got on the freeway! Something similar was in the process of happening to this package unit. As you can clearly see, the wiring had begun to melt from excess heat. This equipment needs service on a regular basis; the filters and coils were very dirty, and the blower wheel was packed with debris. 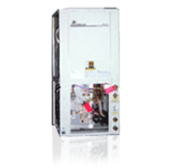 Filters need to be cleaned regularly in order for the machine to run properly. Again, imagine if the air filters on your vehicle were clogged. The engine will have difficulty running. This is why regularly cleaning or replacing these simple and inexpensive parts can keep you from having major difficulties later down the road. 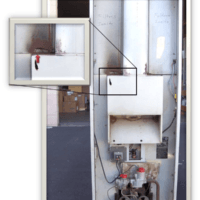 If the owner of this package unit had simply invested in regular maintenance, the technician would have been able to see the wear and tear, or at least prevent the worst of the damage before it got out of hand. 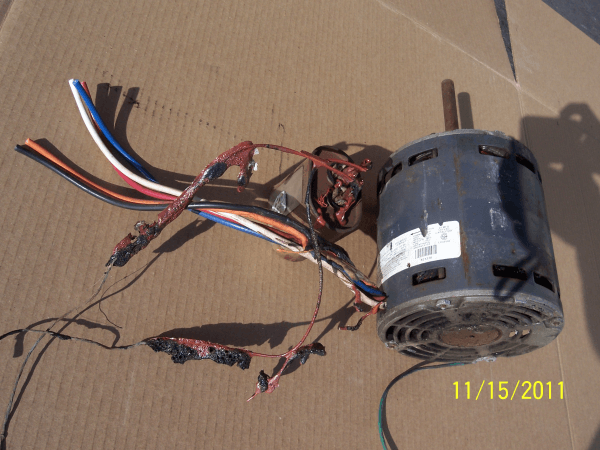 This motor could have started a serious fire had the excess heat from the faulty equipment reached the debris in the filters, coils, and blower wheel. Luckily the market owner decided to call Cold Craft before this caused serious damage! The moral of this story? Regularly cleaning your equipment and replacing your filters will help you avoid a motor meltdown, or worse, and that safety switches are engineered for a reason, don't by pass them.